Evolution is the change in the heritable characteristics of biological populations over successive generations. Evolutionary processes give increase biodiversity at every level of biological organization, including the levels of species, individual organisms, and molecules. We once thought that the neanderthals were the only relatives but recent studies show that the Denisovans also interbred with humans. 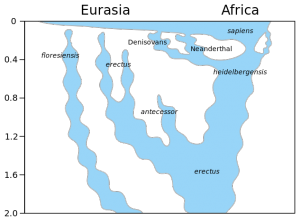 This picture represents the spread of the Denisovans. Modern humans are now the only human lineage left alive but others not only lived alongside modern humans, but also interbred with them, leaving behind DNA in the human genome. But with enough evidence, it has been proven that the mysterious Denisovans are relatives of modern humans. 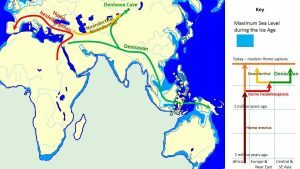 Denisovans also harbor a small amount of especially exotic DNA, probably from breeding with “super-archaic” humans that split from the others over 1 million years ago. Previous research discovered that while Denisovans shared a common origin with Neanderthals, they were just as genetically distinct from Neanderthals as Neanderthals were from modern humans. This diagram shows the spread of human. Are Species We See Everyday Going Extinct Before Our Very Eyes? Video Games: Can They Be Beneficial to a Child’s Learning and Development? "Very interesting how caffeine has been used in research. Caffeine can really impact ..."
"The moment we understand what role trees and forest play in our eath, ..."
"Oak and Maple are my favorite type of tree along with the ..."
"I'm a PD patient and would like to keep up with CRISPR comments ..."